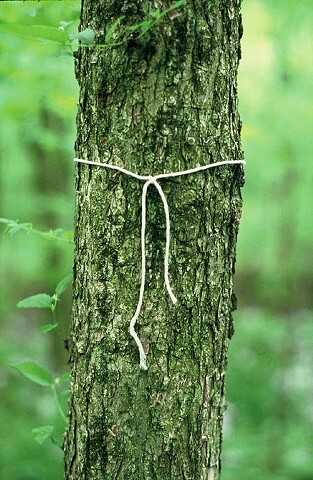 In the center of a wooded site in Northwest Ohio string was tied to a tree and unwound in a clockwise spiral across the junction of two creeks. At the end of the spiral the string was tied to a second tree. The string was then cut at this end, leaving the knotted string on the tree. The string was rewound onto a stick while objects found along the spiral path were wound into the string. When the center point of the spiral was reached the string was cut again, leaving the knotted string on the tree. The ends of the string remained tied to the two trees until they decayed enough to fall off.